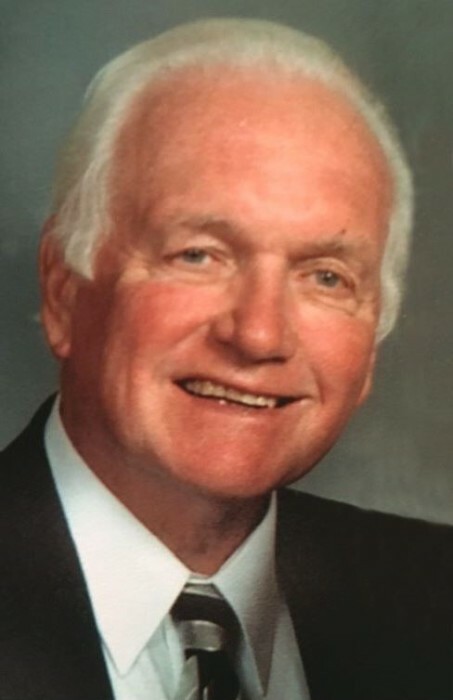 Howard Stanley Weyburg, 85, of Rockford, passed away January 14, 2019 at OSF St. Anthony Medical Center. Born September 8, 1933 in Rockford; the son of C. Stanley and Dorothy Weyburg he was a graduate of East High class of ’51 and Northwestern University in 1955 where he met Carolyn, his wife of 59 years and was a member of Phi Delta Theta fraternity. He later received an MBA from the Northwestern School of Business. Known for his smooth hook shot, Howard was named an All-State basketball player for East High in 1951. He went on to play basketball and golf at Northwestern University. He continued to be a Wildcat supporter and was co-president of the local NU Alumni club along with Carolyn. One of their fondest memories was cheering on the Wildcats in Pasadena at the 1996 Rose Bowl. After graduating from Northwestern, he served as an officer in the Navy. He married Carolyn in 1956 and soon began his lifelong career in the insurance business. His passion for golf was interwoven through his entire life. He was a longtime member of Forest Hills Country Club where he won several club championships. He loved playing, watching, teaching, collecting clubs and perfecting his swing. He was as generous with his advice as he was with sharing his many clubs. He put family first and was a devoted husband, father and proud grandfather who enjoyed attending many school and sporting events through the years. Howie had a compassionate heart along with a clever mind and quick wit. He had a presence when he walked into the room and would hold court as a master story and joke teller at any gathering. He was most content surrounded by family, a cup of black coffee in one hand, a remote in the other watching sports or nature specials with a good dog at his feet. He was preceded in death by the love of his life, Carolyn and his parents. Survivors include his children, Lynne Weaver, Doug (Karen) Weyburg and Kay (Peter) Krhin; grandchildren, Matthew, Kristin, Grace, Jack, Ben and Vivian; sister, Janet (Jim) Mattern; special niece, Ann Elizabeth Carlson; along with several nieces; nephews and dear friends. The family would like to thank the staff of Heritage Woods, Rockford and OSF St. Anthony Medical Center for the loving care they provided. Celebration of life will be held at 11:30 a.m. on Saturday, February 16, 2019 in Trinity Lutheran Church, 200 N. 1st Street with a visitation from 10:00 a.m. until time of service. Private family burial was held in Scandinavian Cemetery, Rockford. Obituary will appear in Rockford Register Star closer to service date.